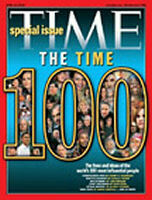 The Time 100: The 2005 list of the world’s most influential people, from the President to Cardinal Ratzinger to Jay-Z. The power to influence comes in many shades. Artist & Entertainers John Stewart makes us laugh, Jamie Foxx makes us cheer, Miuccia Prada makes us look good—the people who turn life into art . . . When he was a kid, Johnny Depp would often come home from school, flip on the TV and watch old silent movies—mostly comedies, especially Chaplin. He didn't know it at the time, but he was learning the craft that has made him the most admired of the movies' younger male stars—in the industry and among the knowing audience. In life, he's a shy, soft-spoken man who, when he's not working, lives quietly much of the year outside Paris. 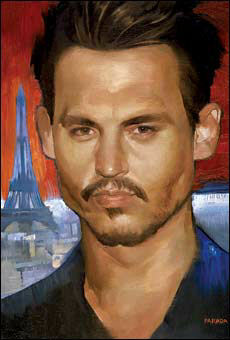 Onscreen, he has frequently played versions of himself—perhaps most notably as J.M. Barrie in last year's Finding Neverland, for which he was Oscar nominated. In these roles, he sometimes hints at a mysterious damage, some ineffable pathos, that he chooses not to explain—perhaps because he does not himself fully understand their sources. It is, however, when he lets his body language do the talking for him that Depp, 41, is at his most arresting. He once impeccably imitated Chaplin's immortal Gold Rush roll dance (in Benny & Joon), thereby openly announcing that he rooted his art in the great, lost mime tradition of the silent screen. His great comic performance (also Oscar nominated) in Pirates of the Caribbean is said to have been based on a close study of the Disneyland ride that was the movie's nominal inspiration. The touch of herky-jerky in his work was an imitation not so much of life but of audio-animatronics—a brilliantly imaginative choice. But he was equally astounding that same year as a casually murderous rogue CIA operative in Robert Rodriguez's Once upon a Time in Mexico—as merry an embrace of psychopathic darkness as the movies have ever offered. Now he's back with his favorite director, Tim Burton, remaking Willy Wonka and the Chocolate Factory. Over the years Depp has run for Burton a rich gamut of grotesquerie: the wounded animal shyness of the prosthetically challenged Edward Scissorhands; the boyishly bouncing Ed Wood, gleefully making his cheapo classic camp movies while maintaining enthusiastic normality amid his casts of outcasts; his postmodern gloss, at once horrific and comic, on Sleepy Hollow. One looks forward fondly to the pair's Charlie and the Chocolate Factory, expecting them to edge the beloved kids' classic with a disquiet that will sail over the heads of children while beguiling their parents—especially those with a taste for acting that is informed by what came before yet is essentially unprecedented.